This morning, I was reading an article on New York Times about Maxwell Gillingham-Ryan, the founder of Apartment Therapy. He says,” the house itself is by far the least important thing. What really matters is creating a place where you can get out of your brain and into your body.” For city-dwellers, the place that helps you detach from the mind is nature. Plants make life in the big city bearable, the air breathable, worries distant, and have a calming effect like no other. 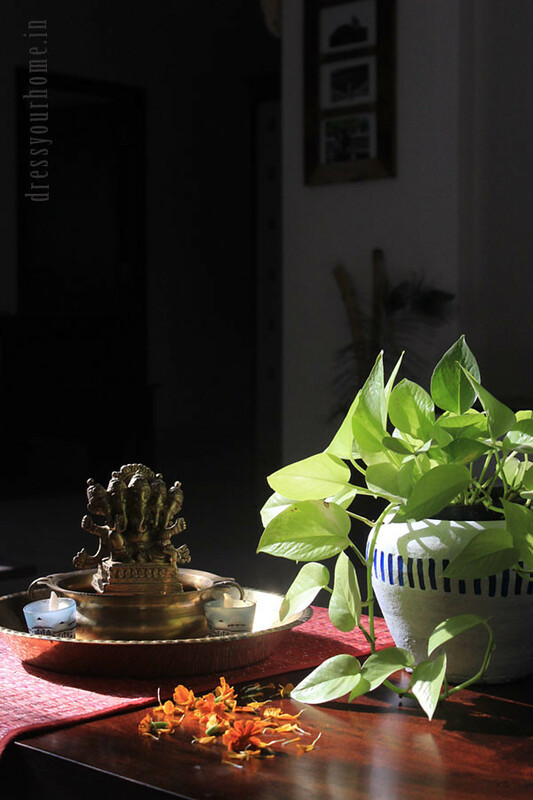 And, I write this post from the green oasis we have created for ourselves. 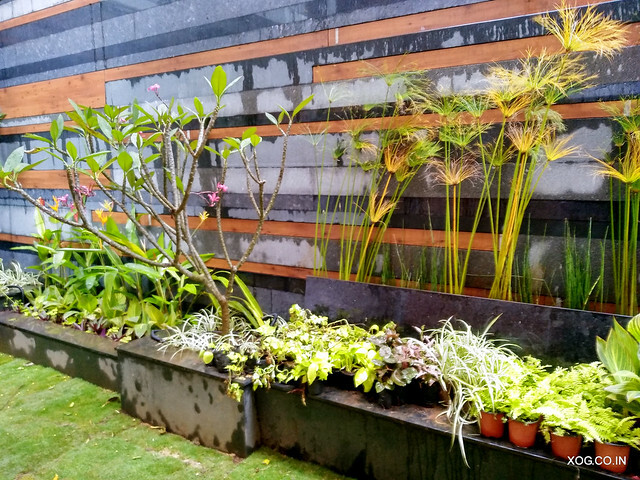 The focus is on nature today, and it’s only apt to feature Xanadu Organic Gardens (XOG). 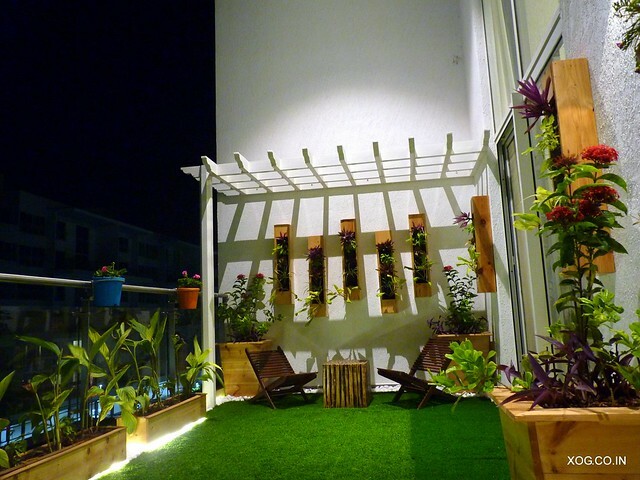 If you are looking for someone to design and install a garden in your apartment’s balcony, backyard, side yard, or terrace, then you may want to read this. XOG, founded by Yohan and Mervyn, is based in Bangalore. 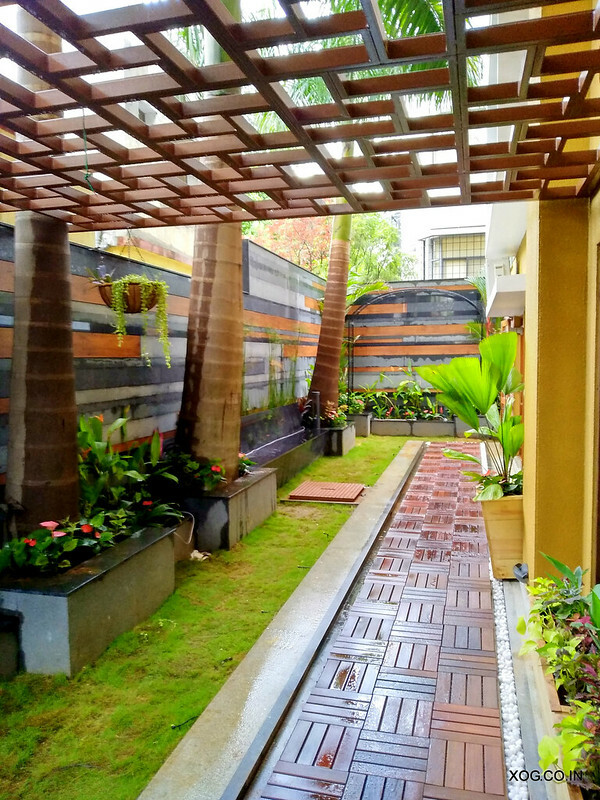 It is run by a nature lover/garden enthusiast, and interior and product designer with the objective of bringing nature into urban homes. They thrive on working with spaces that require creative and unique designs to enhance the client experience of the space. When I reached out to Yohan, what he said about space resonated with me so much so it set the foundation for this post. No space is too small for a garden. 1. 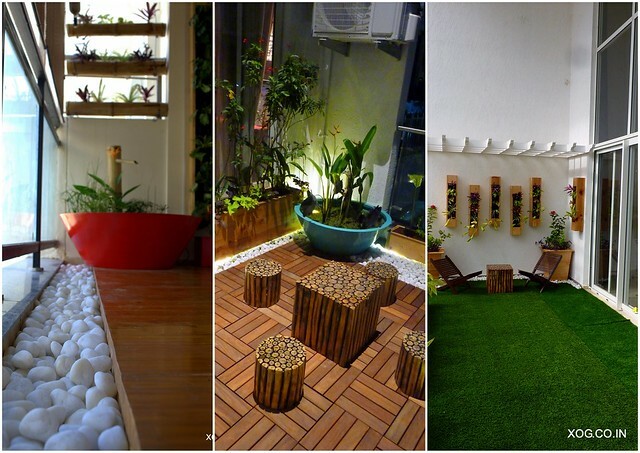 What is the smallest garden space you have designed and the largest? The balconies were heavily shaded by the adjoining neighboring buildings. 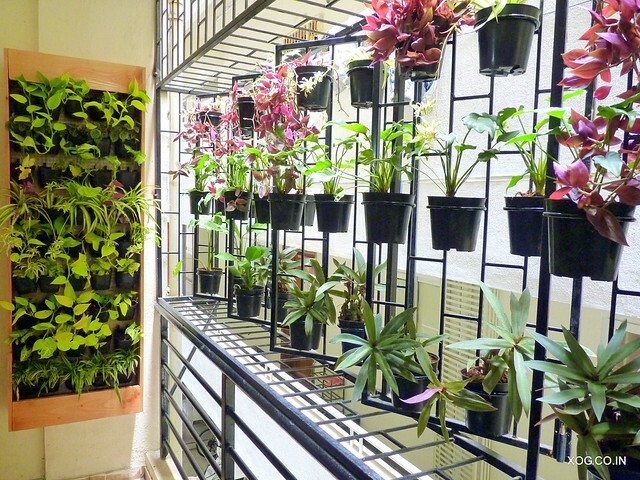 Working around these limitations, we installed a customized garden with over 150 plants in various vertical garden concepts on the walls in just one balcony. 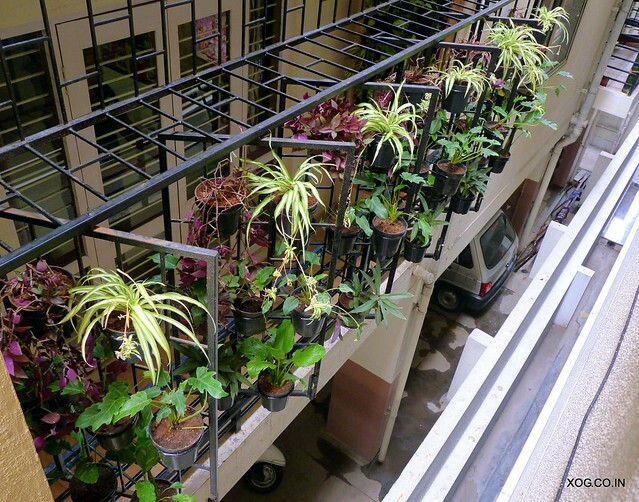 one balcony garden(20’x5’) in the same building. 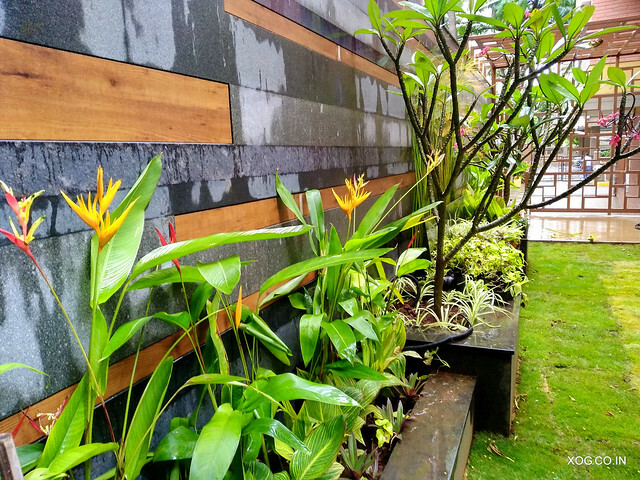 The ground floor gardens were done in contemporary and tropical themes with plenty of colours and flowering plants. These gardens have extensive lighting installed for evening entertainment and are watered by fully automated irrigation systems. 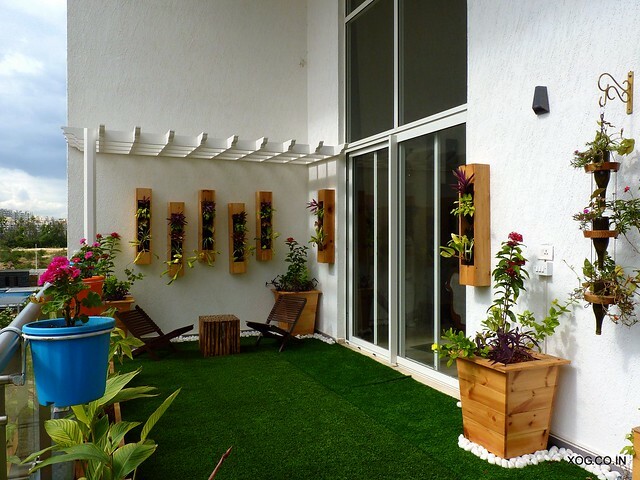 The studios and balcony spaces are designed as container gardens; they have a contemporary theme to match the interiors of the apartments with tropical planting which is loaded with perennial flowering plants and colourful foliage. 2. How large is Sharmas’ garden space? 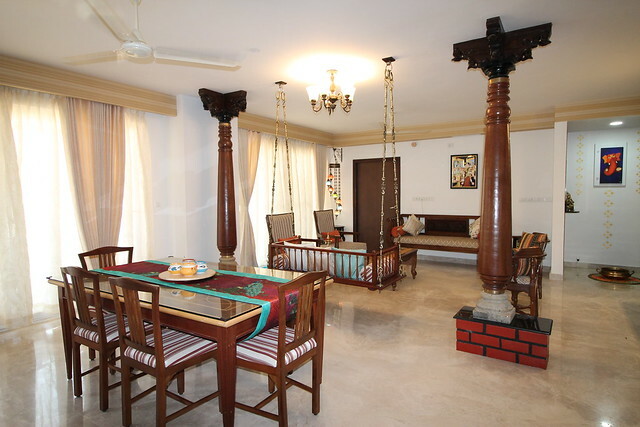 Sharmas’ garden is in the balcony of one of the villaments of Shriram Chirping Woods. The floor space is 26’ x 13’ and it has a double height ceiling. 3. What are the wooden blocks made of that is seen in the flooring of most garden – are they tiles or wood? 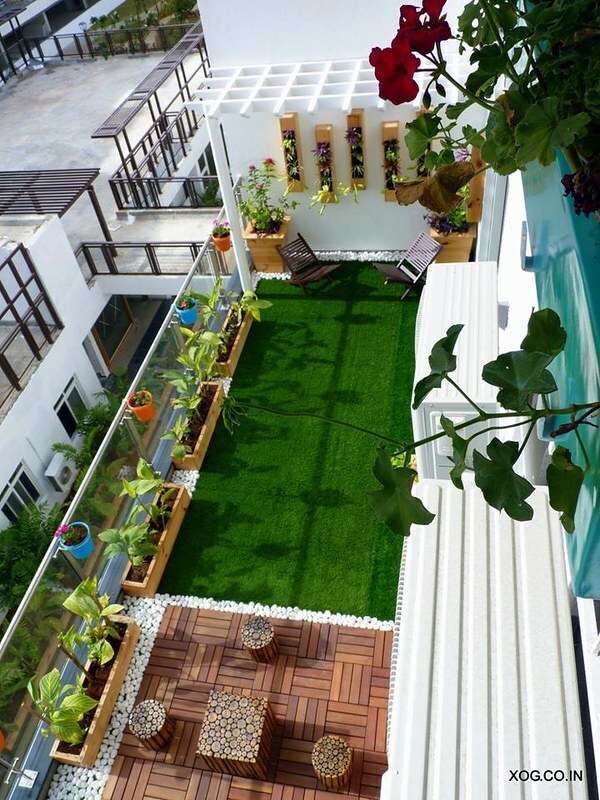 The flooring in Sharma’s garden is a mix of artificial grass, wooden deck tiles and a pebble border. The wooden deck tiles are made of Ipe Wood which is a Brazalian Hardwood. The wood is a rich, warm hardwood which is extremely durable outdoors and has a long life. 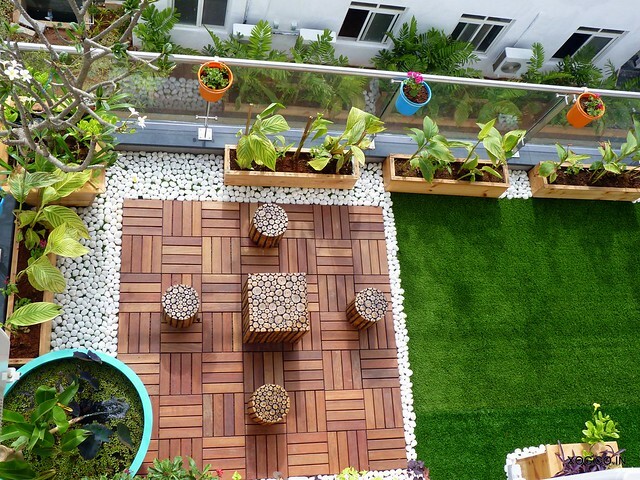 It is a 100% natural wood which is a great option for eco-friendly outdoor flooring. 4. Do you always recommend faux lawn or do you also install actual grass? As an eco-conscious business we always prefer to work with eco-friendly materials or organic materials. 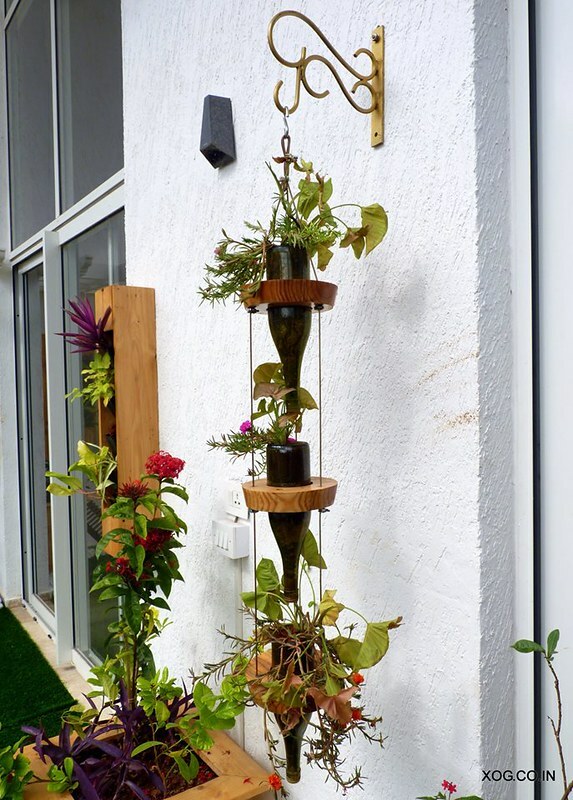 Our designs include plenty of up-cycled concepts and materials which are natural and organic. We usually give the clients the option for a natural lawn for flooring where possible. 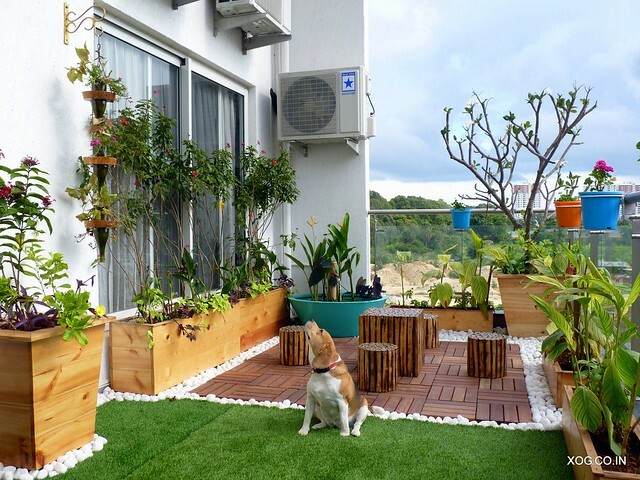 Natural grass lawns in balconies and terraces are challenging as they require the base layer of waterproofing to be done (usually by the builder) as a foundation and require a bit of maintenance and regular watering. 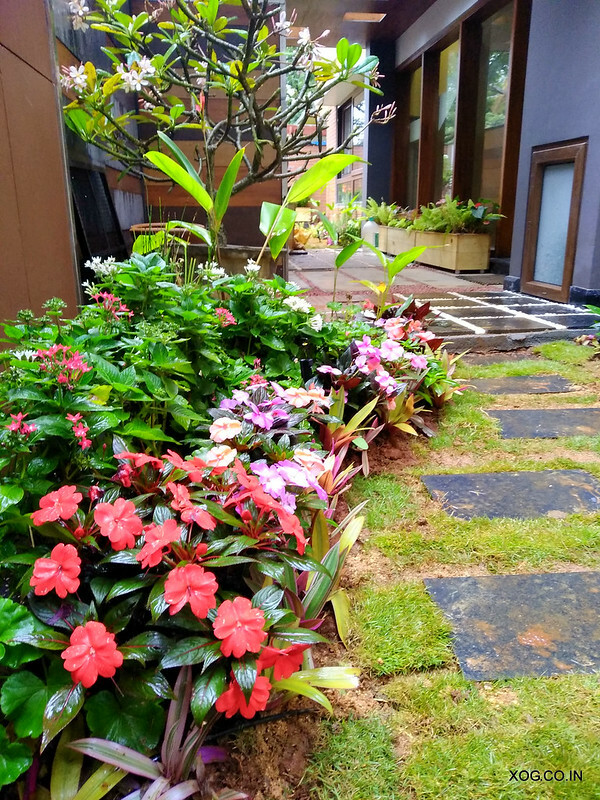 In spaces where the above requirements are not met or difficult, clients opt for the artificial grass lawns which are made of recycled rubber. We also offer wooden deck tiles, wooden decks in recycled Pine and other woods as well as tiling and other solutions. If you are looking for these green thumbs to bring a slice of nature into your home,e-mail XOG on xanaduorganicgardens@gmail.com. Thank you Lakshmi for the wonderful article!